Ryan Reynolds is something of a revelation in Marjane Satrapi’s twisted black comedy The Voices (2014). In his defence, he’s often to be found doing solid work in shaky environs, but this is a performance of exceptional nuance in a role that undeniably warrants his A-game. In her graphic novel Persepolis there’s an exchange in which the young Satrapi comes to understand the value of laughter in holding back the tears. This notion is taken to new extremes in her assured handling of Michael R. Perry’s blacklisted screenplay which twists giggles from psychosis and murder, in a world constructed of coping mechanisms. It’s a heightened and super-stylised world from the opening moments. The town of Milton plays home to the hunky but emotionally stunted Jerry (Reynolds) who has an institutionalised past and now works in an appliance factory clad in garish pink overalls and harbouring a crush on the British gal in accounts, Fiona (Gemma Arterton). She’s way out of his league, as he’s told with bilious spite by his roommate – the talking cat, Mr. Whiskers (voiced by Reynolds). The dog, Bosco (also Reynolds), disagrees but lacks the verbal dexterity to exchange barbs with his feline opponent. It’s obviously clear from very early on that all is not right with Jerry. Reynolds plays him as somewhat slow and harmless, but there’s a sadness behind his eyes and ensconced in an eternally furrowed brow. He’s charming but in a simple way that comes from a deep-seated need to please others. Fiona, sadly, turns out to be effectively a trashy Tamara Drewe who plays fast and loose with Jerry’s feelings – jilting him after non-committally agreeing to go on a date, and setting off a chain of grisly events with Mr. Whiskers spurring his impressionable human on. 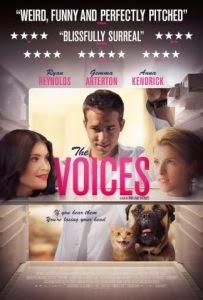 Not only is The Voices uproariously funny throughout, but it’s actually far cleverer than one might expect. It’s not intended to be a realistic psychological study of mental illness or paranoid schizophrenia, but it mainlines those complexities into its style and substance. The slasher genre is not only subverted in evoking empathy for Jerry, but actively presenting the horror of being him – as opposed to being stalked by him. Of course he has mother issues, but these are framed in traumatic sequences in which off-kilter camerawork and screeching sound design create an unpleasant waking nightmare. Both of those elements are strong throughout, with heightened perception – and the slow realisation that we’re seeing the world from Jerry’s point of view – often tearing through in a moment of aural distortion or visual delusion. Maxime Alexandre gets the colours to pop in his cinematography and nicely homages genre elements in his composition. Although the edit fumbles a couple of moments, it makes the most of a surprise car crash and the missteps are minor. Really, this is Reynolds’ and Satrapi’s show and they’ve both done fantastic work, creating a gory horror-comedy that is funny, unsettling, character driven, and unexpectedly deft. Plus there’s a foul-mouthed cat.